The big picture in the construction of China's social credit system via a blacklist has taken initial shape, and losing credit in one place might mean an entity is restricted in other places. Coordinated efforts among different departments have led to strengthened punishments and yielded positive results, according to an annual analysis on the blacklist for discredited behavior, which was released by the National Development and Reform Commission (NDRC), China's top economic planner, on Thursday. As of the end of 2018, there were 12.77 million entities subject to credit penalties as disclosed by courts nationwide, while China restricted persons with bad social credit scores from taking more than 17.46 million flight trips and some 5.47 million high-speed train trips, the NDRC report showed. Last year, more than 2 million entities exited the blacklist, including 1,417 taxpayers, after paying duties and fines, said the report. Zhi Zhenfeng, a legal expert at the Chinese Academy of Social Sciences in Beijing, told the Global Times on Thursday that China has made pragmatic progress in building up the social credit system since 2014. "Honesty and integrity, the core values of China's society, have been given more and more attention in recent years." A total of 44 government departments have decided to tighten regulations on the statistics sector by such moves as revealing the information of discredited individuals or companies to the public and taking joint disciplinary actions against such people and companies based on relevant rules, the NDRC said on December 25, 2018. "It is important to eliminate the 'lonely islands of data'," said Zhi, referring to the inefficient sharing of data among different departments. Zhi also expressed concern over private data protection, which also requires joint efforts at the government level. "The construction of a social credit system calls for legislation," he said. "With the nation beefing up efforts to enhance social credit building, penalties for bad credit will range more broadly. Meanwhile, this needs to be analyzed according to specific cases," he added. 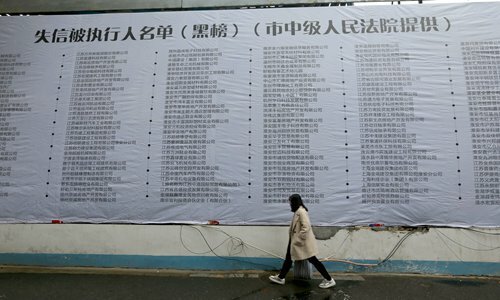 In terms of regions, among the 3.6 million entities newly added to the blacklist, most focus on the developed southern and eastern regions of China with East China's Jiangsu Province and South China's Guangdong Province taking up 16.71 percent and 12.77 percent each, according to the report.